I am so excited to be sharing some fabulous free crochet patterns perfect for holiday gift giving. This easy crochet kids cowl is just one of the many ideas you will find the whole month of November. If you have a little boy on your list this crochet bow tie is darling! I also didn’t realize how easy it was to crochet a hat. So go ahead and grab a hook and stitch up a heartfelt holiday! I have teamed up with Your Homebased Mom (gifts from the kitchen) and Thirty Handmade Days (crafty tutorials) to help you create the perfect handmade holiday.By the end of the month we will have shared over 100 creative handmade gift tutorials. We even have some amazing giveaways. Each day be sure to visit the guest poster’s blog for a chance to win BIG! So today you will want to head over to Skip to my Lou for a chance to win a $300 Michael’s Gift Card. Yes, $300! Can you imagine all the yarn you could buy! Hello everyone! I’m really excited to be guest posting here at Skip to My Lou. 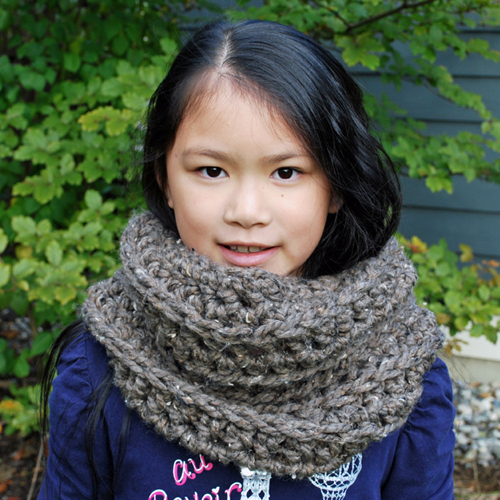 Today I will be sharing a pattern for an easy to work up crochet cowl for kids. 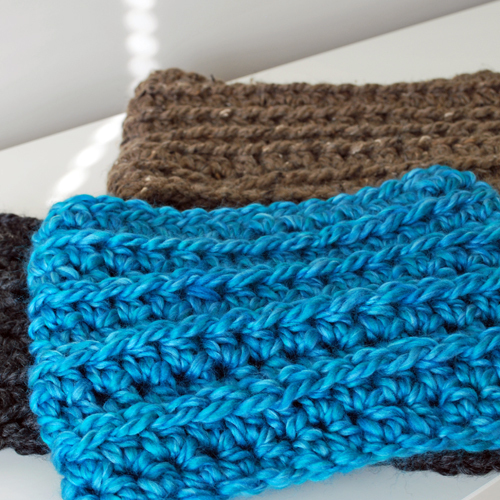 This simple cowl scarf makes a great handmade gift or stocking stuffer. I’ve just finished two for my girls and they love wearing them. 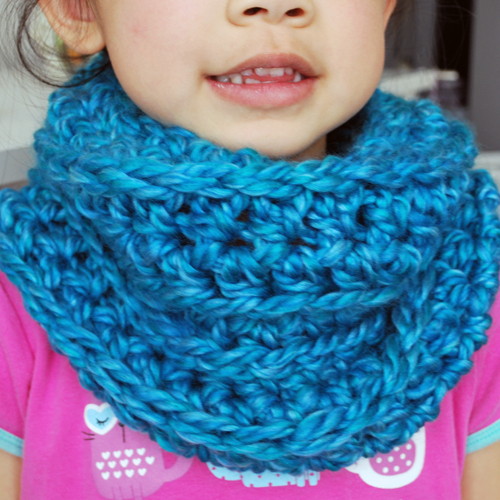 This crochet kids cowl is so simple and easy to make it. I’ve been working on mine while catching up on my TV shows in the evening. 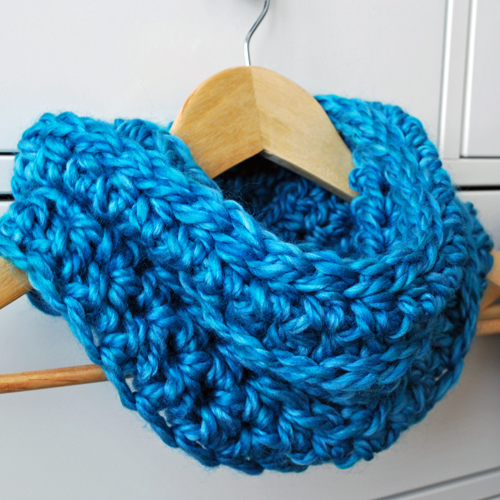 To make this cowl you will be crocheting with the large blue hook from the set. The smaller hook is really handy for weaving in the ends of the yarn. Round 2: Ch 2, hdc in the back loops of the next 29 stitches. Sl st into the first stitch to join the round. Total of 30 stitches. Round 3: Ch 2, hdc in the next 29 stitches. Sl st into first stitch to join the round. Round 4: Ch 2, hdc in the back ridge of each stitch. (Half double crochet stitches have a third loop at the back of each stitch – see this post for photos) Sl st to join the round. Repeat round 3 and 4 until you have completed 10 rounds. Round 11: Sl st in each stitch. Bind off and weave in tail with the smaller hook. When laid flat, the finished cowl measures approximately 9″ x 11″. It’s hard to capture just how gorgeous the colour of this yarn is. I used Loops and Threads Cozy Wool in Caribbean Sea. The pictures show more of a solid blue; whereas in person the yarn is a variegated deep turquoise. It is difficult to describe but you can always head to Michaels to take a look at the yarn. My daughter really likes turquoise and teal blue so I let her pick out the yarn. If I were making this for myself it would be grey! I hope you enjoyed my Easy Crochet Cowl for Kids pattern/tutorial! If you have any questions, be sure to visit my blog and send me an email! My name is Shani and I’m a stay at home mom to three beautiful girls. 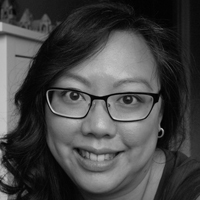 I love working on projects and I’ve been blogging about them at inspirednest.ca for almost 4 years. My projects and interests are constantly changing but some of the things I really enjoy doing include crocheting, knitting, building furniture, sewing and paper crafting.